As a social worker, I am expected to case note everything I do (phone calls, emails, client appointments) within 48 hours of the event occurring (but preferably immediately). This is for obvious reasons – the longer you leave it, the more likely you are to miss important details. Before I leave work in the evening I catch up on any notes from throughout the day that I haven’t yet had a chance to write up. I only wish I could have such a sense of urgency with my blogging! 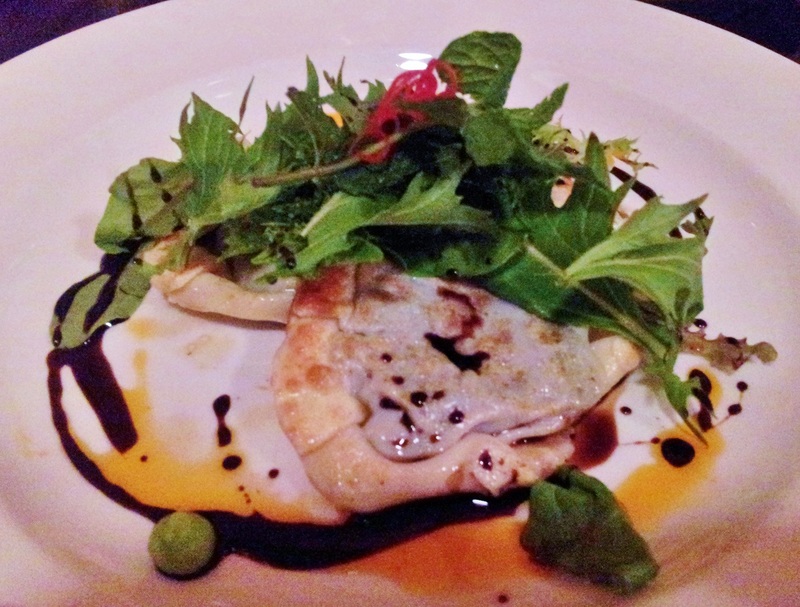 This post dates back to March, and as a result, the details of the meal are kind of fuzzy. This meal took place as a celebration for me starting my first ‘real’ job, and so naturally I chose to have it at Shakahari. Shakahari have long been one of my favourites – I’ve had many a ‘special occasion’ dinner here, in fact, it has always been one of my main go-to celebration meal place. 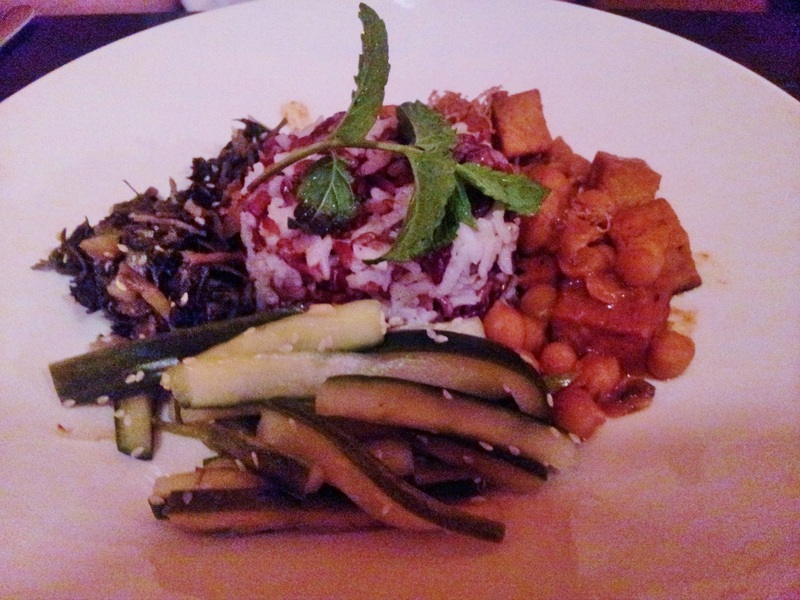 Even with more and more amazing vegan eateries popping up all the time, Shakahari still holds a special place in my heart and continues to provide outstanding vegetarian food. I still remember drinking my first ever long island iced tea here on a birthday years back. Shakahari have been dishing up amazing vegetarian dishes in Carlton since 1972, and have now expanded to open a second restaurant – Shakahari Too – in South Melbourne. They also hold the title of the longest running exclusively vegetarian restaurant in Australia – how cool is that? We got a couple of entrees to share to start us off, and found it difficult to select just three. 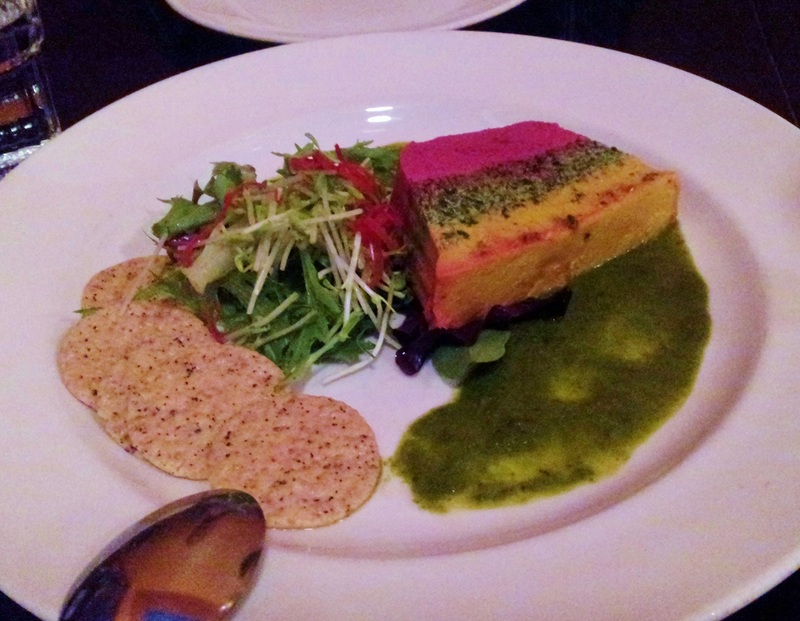 This was the rainbow pate – I was definitely attracted to the colour in this dish. The pate was lovely, though we could have done with a couple more crackers to split between us. This is a terrible picture of the avocado magic – a sort of avocado tempura. I remember enjoying this one a few years back, and it didn’t disappoint this time either. The sauce is coriander based, and brings a wonderful strong flavor to the creamy avocado. Lastly, some delicious treats – I can’t remember what they are! I’m looking at the menu thinking it must be the mushroom agnolotti. Whatever it was, I do remember it was delicious. 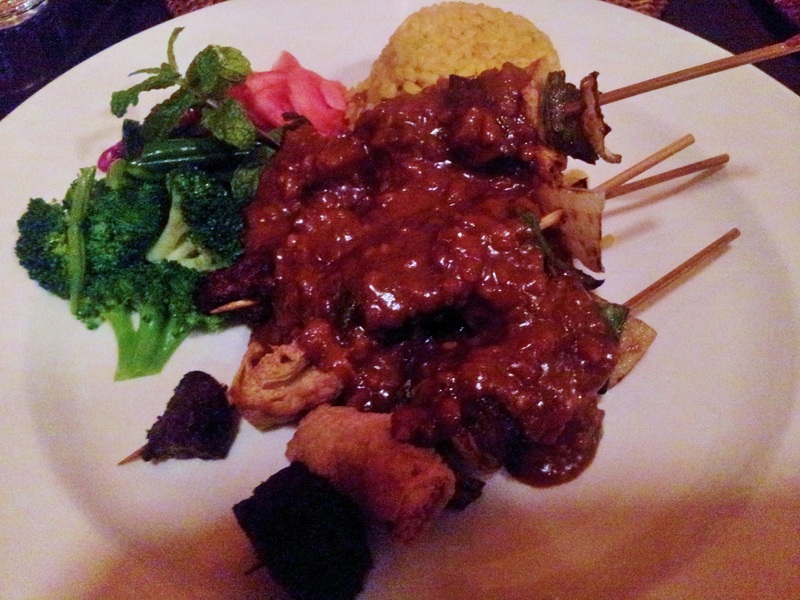 For my main, I ordered the ‘Legendary Satay Shakahari’. I can understand why it’s legendary – the satay sauce is the stickiest, creamiest, peanutiest satay sauce ever, and the differing textures of the tofu, seitan and vegetables work a treat. Other orders on the table included this dish, which again, I cannot remember – it had many components and from memory the zucchini bits were kind of pickled? 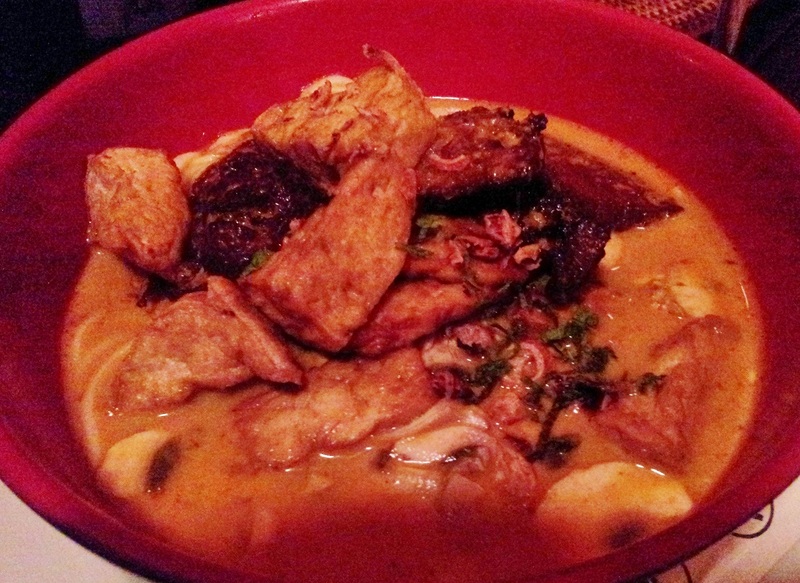 A couple of people on the table went for the laksa, which was also full of amazing tofu, tempeh and seitan textures. 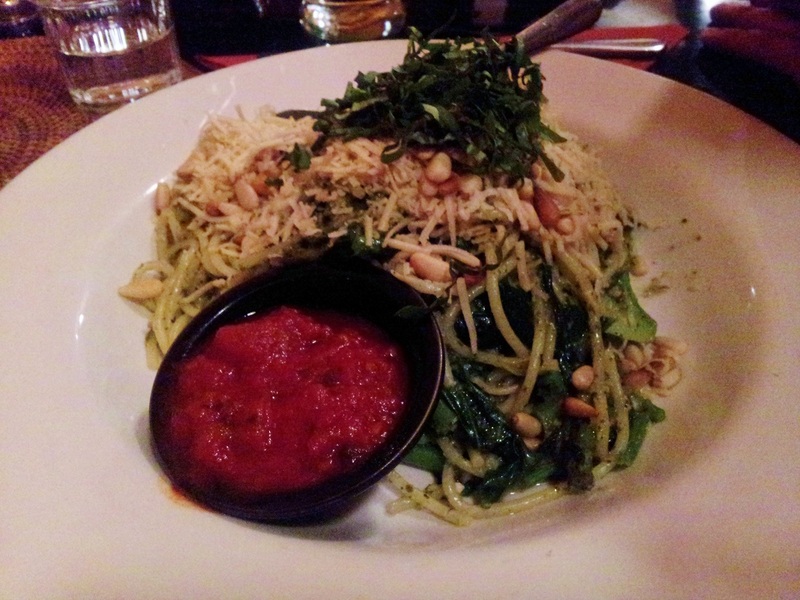 Somebody else enjoyed this beautiful pesto pasta dish, topped with soy cheese and pine nuts. I think there was another main, but it didn’t make the cut due to it’s non-veganness (totally a word). Finally, what meal at Shakahari is complete without a tofu crème caramel? ARGHYUMMM. 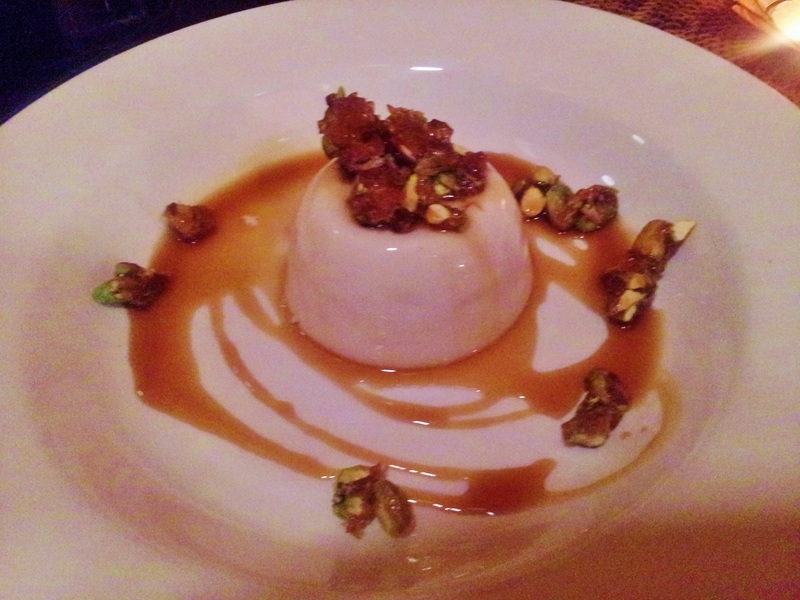 This is a perfect dessert – silky tofu topped with crunchy pistachio toffee and drizzled with a sweet caramel sauce. Yaaaaayyy! I think most people on the table got this, though there were a few non-vegan options making an appearance too. Phew, I bumbled my way through that one. Luckily, my blog is not going to ever be subpoenaed for court (I hope), so I guess the sketchy details don’t matter too much. Or the sketchy photos. Hmm. Lesson learnt – I think it’s time to try and cut through my backlog again. 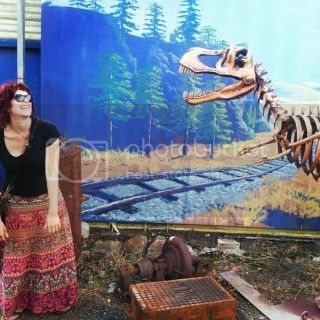 See you soon blog-world! I know the feeling of looking at older photos and wondering whatever was that! Sometimes when I take photos I know I will want to blog in future but not just yet I give them a long title with the actual name of the dish – though I know even finding time to name photos can be hard and I stall on that sometimes too. Well done for resurrecting your memories and making note of what looks like a great dinner – that rainbow pate looks brilliant – I love Shakahari but haven’t been for ages – not since a 40 degree day when their air conditioning struggled – must go back again soon. Thanks Johanna – that’s a great idea. I have been meaning to start something like that – I had been meaning to jot something down in a notebook or whatever, but it all seemed a little too homework-y. Labeling the photo files seems like a much more efficient way to get around that! it all looks so delicious! and that rainbow plate looks amazing! These pictures remind me so much of my favourite vegan restaurant. Everything loos so beautiful and delicious. It certainly was! I guess being in the business for so long, they have got making delicious meals down-pat! Shakahari is Ben’s family’s go-to celebratory restaurant too! I’ve had a couple of super delicious meals there with them, it’s so nice to have options, and it’s just that bit fancier than most other all-veg restaurants! Yeah, there’s definitely some other fancy options popping up but Shakahari is pretty solid! I always try to take a little notebook with me to places I’m planning to blog about, especially when I’m travelling and eating at 2 or 3 new places a day! 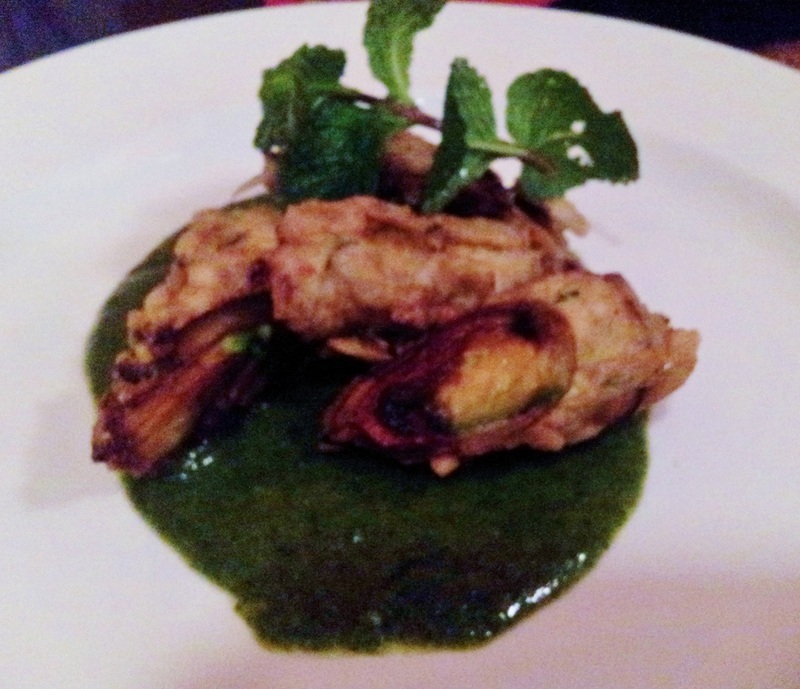 Shakahari sounds wonderful especially because they have avocado tempura with coriander sauce, that’s like my dream dish!! That’s probably a good idea – I seem to have a goldfish memory! I love Shakahari, and was supposed to go there for my birthday this year, until it got hijacked (my birthday, not Shakahari). I’ll have to have a makeup dinner. I ALWAYS have Avocado Magic, Satay Shakahari and Tofu Creme Caramel. I always SAY I’ll have something different, but I never do. Hehe I’m glad Shakahari didn’t get hijacked! I hope your bday ended up hijacked in a good way? It’s soooo hard to steer from the dishes you know and love – that’s why I love going with others so that I can taste their plates too! I feel you, I may not be a case worker, but I love to note everything especially for travels whether it comes to accommodation, transportation, addresses, details for the dishes, etc. I wish I’d wrote down the name of dishes/details I’d tried few years ago before I started this blog. Ah, Shakahari Too in south Melbourne – so awesome that it’s the longest running vegetarian place…I must check this gem out! Can you recommend a couple of awesome vegan eats in Melbourne? I’ll be staying there for a month…so curious to know what’s like eating vegan there 😉 Goodness, the satay looks absolutely saucy and yum! I would love to try all the dishes you’ve tried, they all look wonderful! It’s definitely a good thing to be organised like this! Oooh, yes Shakahari is definitely a great one – let me have a think of some of my favourites and get back to you. When are you going to Melbourne?